“As a leading public research university, MSU has the fantastic opportunity to showcase these innovative and sustainable construction methods in the state of Michigan,” Satish Udpa, MSU’s acting president said. CLT has been used in Europe for more than 20 years, with recent interest in Canada and the US, especially on the West Coast. “We compared mass timber with other framing methods and were intrigued by how far wood has come as a building material,” = John LeFevre, MSU’s Planning, Design and Construction director said. 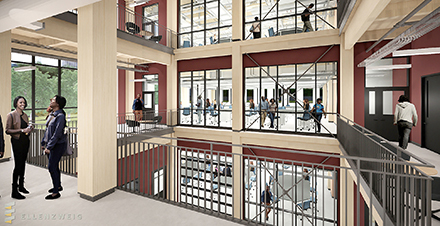 Two new mass timber wings will offer 117,000 square feet of modern teaching labs, responding to STEM course demand, which has increased 40% in the last 10 years at MSU. The pleasing aesthetics of exposed wood also create a warm, inviting and atypical environment for learning science. “I am excited to see the educational, research and outreach opportunities that the building itself promises to many academic units and to our land-grant mission,” Ron Hendrick, dean of MSU’s College of Agriculture and Natural Resources said. Currently there is no CLT manufacturing in Michigan, although it’s a prime place for future development. In addition to economic development, the building will have environmental benefits, especially for locking up carbon that otherwise would be in the atmosphere and contributing to climate change. In fact, many conservation organizations, including the Michigan Nature Conservancy, Michigan Department of Natural Resources and the Michigan Forest Biomaterials Institute are actively promoting mass-timber construction. Many believe the MSU building will catalyze additional mass-timber construction in the state, which might lead to establishing CLT manufacturing in Michigan.